I've gone too long without commenting on the status of Marine Sgt. Andrew Tahmooressi. It has now been 100+ days that he has been imprisoned in a Mexican jail for making a wrong turn at the Mexican border and declaring his mistake and possession of firearms. The weapons are legal in the United States but not Mexico, and he was detained when he inadvertently crossed over the boundary in late March. I have been to the Mexican border and believe me, it can be quite confusing; and once you have committed yourself to the "entry lane" into Mexico, concrete barriers prohibit any change of direction or return. Sgt. Tahmooressi is a decorated Marine who suffers from PTSD after two tours of duty in Iraq and Afghanistan. He has received very little attention from our administration; in fact their response has been, "We need to let the Mexican justice system take its course." Meanwhile, another soldier, Sgt. Bowe Bergdahl, has been paraded before the world for his release from Taliban captivity. There were major White House announcements about "the returning P.O.W." and news conferences in the Rose Garden. Yet the subject of Sgt. Tahmooressi is avoided in White House press briefings as if he is of no consequence. For whatever reason, the left-leaning media wants to portray Tahmooressi as less than honest in his story, and point to the somewhat dicey approach of his first Mexican lawyer as proof that he has something to hide. Yet where are they when it comes to questioning Bergdahl's story? There are more than enough members of his platoon that will testify to his hatred of America and his abandonment of his post. But his questionable relationship with the Taliban is inadequately examined. And now he has a nice little desk job at an Army post in Texas. World Net Daily reported that in an interview from his Mexican jail cell, Tahmooressi confirmed that the U.S. State Department has not contacted him, nor has he been able to talk with them. One has to wonder -- What is the ulterior motive behind how differently these two soldiers have been treated? How can the White House boast about the return of Bergdahl, and that "we never leave anyone behind"? Aren't we doing just that with Sgt. Tahmooressi? Our country has paid an extremely high price for the return of an alleged deserter and Taliban sympathizer. What is our government willing to pay for the return of an honorable and decorated war hero? Perhaps that's where the real story lies, and how our military is undervalued and disrespected. Sgt. Tahmooressi told World Net Daily that he trusts God for his future – but he’d also like an answer from his Commander-in-Chief. That's the least he deserves. He also asks for our prayers and our vigilance on his behalf; that we keep his captivity before the public, the media, and the White House. And that's the least we can do. May God strengthen Sgt. 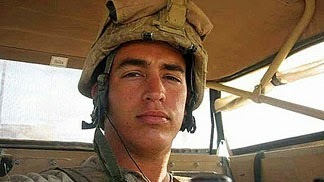 Andrew Tahmooressi in his hour of need. Joshua 22:3 "You have not forsaken your brothers these many days, down to this day, but have been careful to keep the charge of the Lord your God."